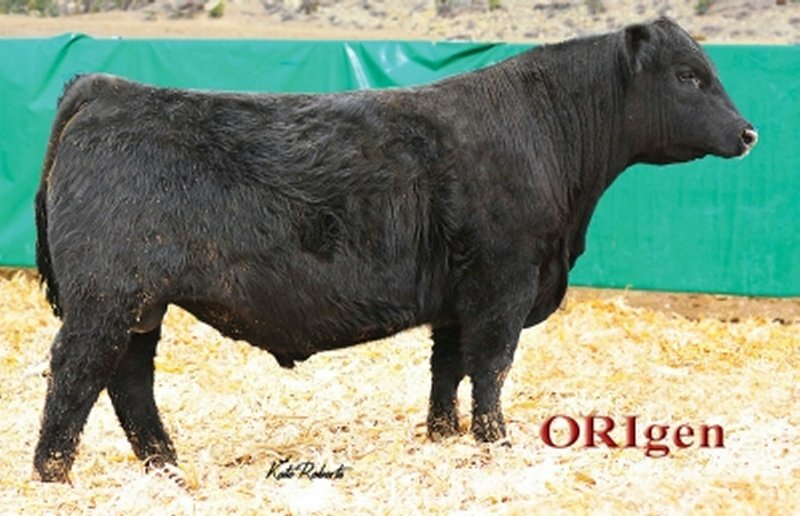 � Among the elite top 1% of the population for both Rib Eye area measure EPD and $Weaned calf value index, this $29,000 feature that led off the 2016 Montana Performance Bull Coop Sale at Midland represents the next step forward from his sire that sold for $105,000 as the top-selling bull at the 2014 Midland Bull Test Sale. � Dam is a top production cow in the Basin Angus herd and she stacks two foundation ORIgen Pathfinder Sires and the grandam of this young sire is likely the all-time greatest daughter of the Basin foundation female sire Special Focus and she has produced a long list of top-selling progeny at Express Ranches in Oklahoma and Teixeira Cattle Company in California. � Elite like his sire for both Weaning Weight EPD and Yearling Weight EPD, this young sire excels in the bio-economic indexes of $Beef value index, $Grid value index and $Feedlot value index in addition to his impressive $Weaned calf value index.